The 101 best foods to lower blood pressure, control cholesterol, and boost heart health! Reduce your risk of heart attack and stroke now! 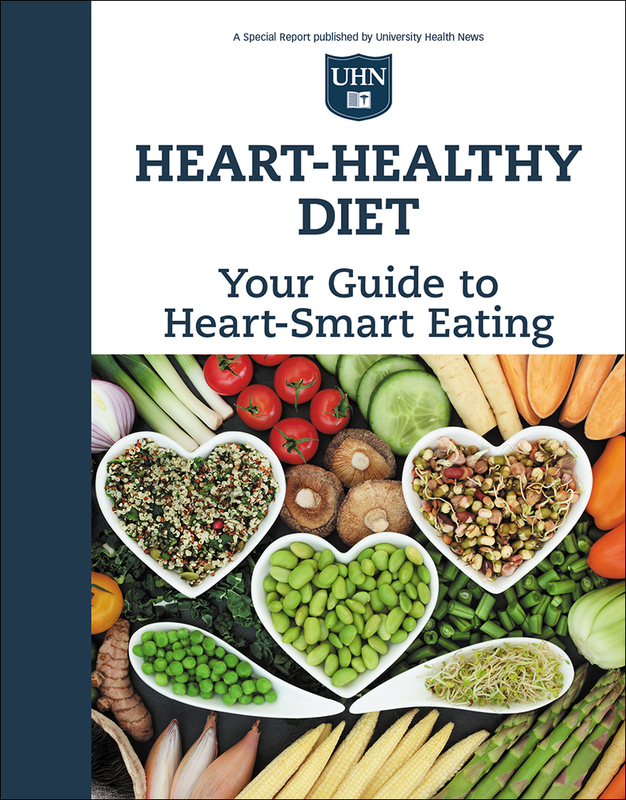 Order Heart-Healthy Diet, new from University Health News, risk-free today! 101 foods that will supercharge your heart’s healthy future and make calorie counting a thing of the past! In this new report from University Health News, you’ll discover foods with protective power for your cardiovascular health…foods that can dramatically reduce your risk of heart attack and stroke…foods packed with the natural goodness that promotes lifelong wellness. Meet the foods you can eat to your heart’s content! You already know that some foods are better for your health than others. Get ready for the best of the best! The nutrition experts at University Health News will introduce you to the foods that do the most to foster heart health. How about a fruit that can lower bad cholesterol 20% AND a vegetable than can boost good cholesterol 30%? Or how about an indulgent sweet that can reduce your risk of a fatal heart attack by two-thirds? Or how about a snack that, the more frequently you eat, the longer you’re likely to live! These are foods that will add to your health without taking away from your enjoyment…101 delicious, nutrient-rich superfoods that belong in your shopping basket—and on your plate! Foods that make a difference you—and your doctor—can measure! This book couldn’t be more timely. Just this year, the American Heart Associ-ation reinforced the importance of controlling your blood pressure with new, stricter guidelines. Lower blood pressure is vital to your heart’s health. In Heart-Healthy Diet you’ll meet 10 helpful blood-pressure-reducing foods including a spice that can lower systolic pressure by 20 points and two berries that not only lower the risk of hypertension, but may also slow the aging process. Do you worry about your cholesterol? You’ll want to turn to Page 22. There you’ll greet the Power 5… five foods that can significantly lower your levels of bad cholesterol, raise your good cholesterol, and reduce your risk of heart disease. And don’t miss Page 57 where you’ll meet three double-duty spices that will pep up your meals and bring down your cholesterol numbers too! Speaking of numbers, you’ll find foods to help take off a few inches. You’ll find the best fruits and vegetables for weight loss. Plus, you’ll discover the budget-friendly organic food that’s loaded with 19 key nutrients and is also a natural appetite suppressant. Talk about bang for your buck! Heart-Healthy Diet comes to you from University Health News. You’re getting proven facts based on independent studies and cutting-edge research from leading universities and institutions around the nation—and the world. You’ll learn about an easy side dish substitution that can help lower systolic blood pressure 8mm…a heart-healthy fruit that prevents dangerous plaque build-up…and a daily beverage that is good for cardiovascular health and may protect against Alzheimer’s disease. You’ll be introduced to 7 surprising superstar foods that pack more punch and power. The good news is you can attain the lasting benefits of a heart-health-boosting diet while enjoying an abundant and varied wealth of food choices. Turn to Page 48 and you’ll discover an increasingly-popular meat with half the calories of beef, one-fifth the fat of lamb, and more protein than chicken! And did you know about teff? It’s the world’s tiniest grain, but has five times the fiber and 25 times more calcium than brown rice. It’s not only heart-smart, but can aid in regulating blood sugar, weight loss, and colon health. And how about putting a kiwi in your fruit bowl? Not only are they high in vitamin C and E, but in a recent study, adding kiwi to a daily diet reduced triglycerides by 15%. You’ll also meet the vegetable that provides the most folic acid per serving… the bean that has the highest antioxidant activity of all beans…a fruit with the demonstrated ability to significantly lower a woman’s risk of stroke. You’ll enjoy foods that fulfill your needs—and exceed your expectations! Heart-Healthy Diet will help you get the greatest reward from nature’s bounty. You’ll meet foods that not only foster enduring cardiovascular wellness but can fortify your health, quite literally, from head to toe. Foods which are good for your heart can also help you maintain keener eyesight, a sharper memory, more supple joints, and even smoother skin. And how about some food for thought? Salmon? Yes, it’s brain-food. But if fish is not your dish, raspberries and blueberries not only safeguard the heart, but can protect against age-related decline in memory and enhance cognitive performance. You’ll find two heart-smart foods that can keep your joints more limber…five colorful foods that are a bright idea for preventing premature skin aging …and a small stone-fruit that offers big protection against gout! At last! Food and diet guidance you can take to heart! Creating a heart-healthy diet doesn’t have to be a puzzle. Not when you have the pieces. You’ll learn how to incorporate the very best, most nutrient-rich, heart-protective foods into meals and menus you’ll make again and again. You’ll see how easy it is to select, shop for, and enjoy foods brimming with cardiovascular benefits. These powerhouses are neither exotic or expensive. In the Report you’ll also get a close-up look at five heart-healthy eating plans …and you’ll get nearly two dozen recipes you—and your family—will savor. The right diet pays lasting dividends in health and wellness. That’s why your food choices are so important. And the good news is, making those choices needn’t be a chore or a challenge. Don’t wait another day to protect your heart’s future. Satisfy your “healthy appetite” today! Send for Heart-Healthy Diet now. Heart-Healthy Diet is ready now at the lowest price you’ll find anywhere. There’s no reason to wait! To avoid any delay, order today!